The Granite Gurus: FAQ: Can I cut on my granite? FAQ: Can I cut on my granite? 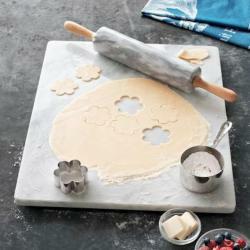 Granite & marble make great rolling/ pastry boards & cheese plates though. If you are a baker or candy maker rolling out the dough or candy on the cool surface is great because the slab remains cool, making the dough easier to handle and roll out. People like to use stone for cheese plates because it keeps the cheese the right temperature while serving it. Its a great article that you have posted. Very informative. We also advise our Granite buyers to make the most of the money they have put in. A little care they say goes a long way.